A Hartford police officer shot a man who authorities say lunged at officers with a knife during a domestic violence call on Friday. 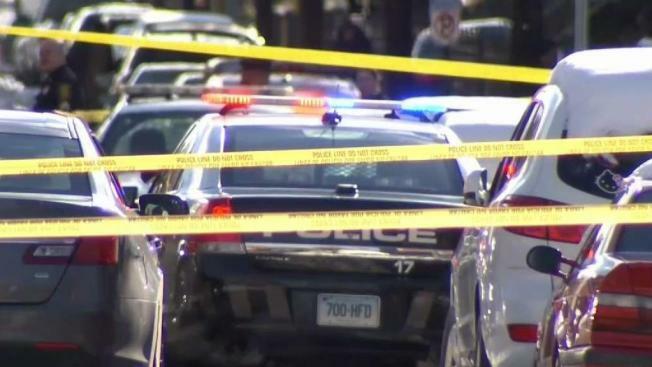 Hartford police shot a suspect who had a knife while they were responding to a disturbance call Friday morning and the person who was shot has been taken to the hospital. Police said two patrol officers were responding to a 911 call reporting a man with a knife holding a woman hostage in the 400 block of Garden Street at 10:58 a.m. When officers arrived, man with a knife confronted them. The officers pleaded with the suspect several times to drop the knife, according to police. When the suspect refused, Officer Chris White, a 15-year veteran of the force, fired his weapon, striking the suspect. The second officer on scene, Officer Michael Bodner, did not fire his weapon. A signal that an officer was in trouble when out through the city and all available officers responded to the scene, according to police. The male suspect who was shot was taken to St. Francis Hospital, according to police. At last check, he was in surgery. Police said neither of the two officers was hurt, but both were sent to the hospital for observation. The Hartford State’s Attorney’s Office and Connecticut State Police will investigate the incident.